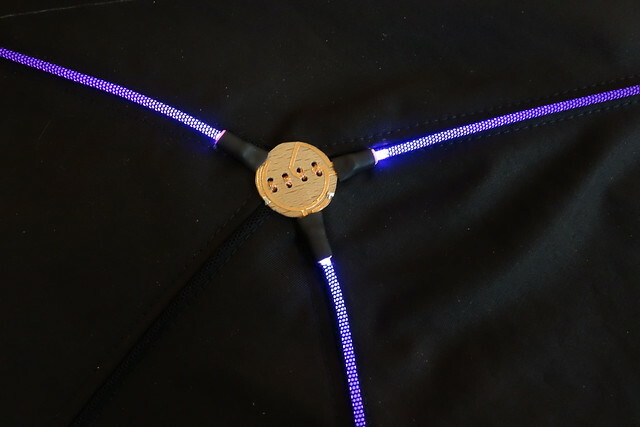 Sebastian has commissioned us to re-make his favorite hoodie/jacket with controllable/programmable lines of light on it that can light up to form geometric shapes and patterns. 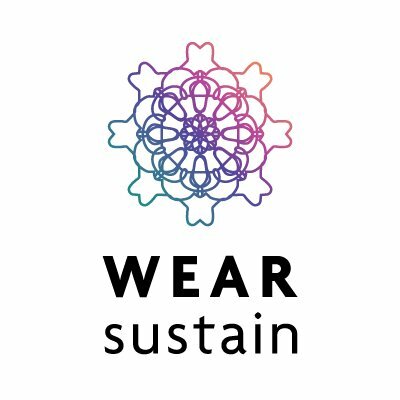 The Pattern – to copy or re-make? Since taking a closer look at Sebastian’s jacket I’ve also seen other people wearing a similar design but constructed differently. 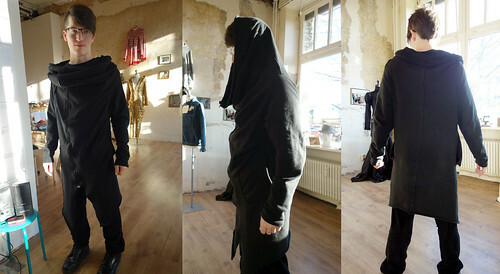 Some from non-stretch fabric. 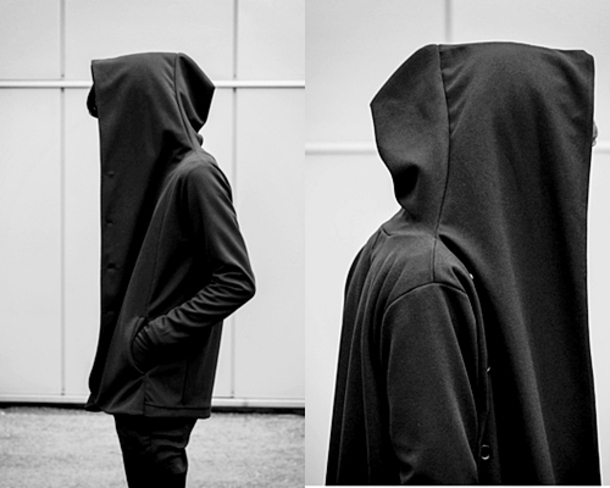 And some with a more defined hood. 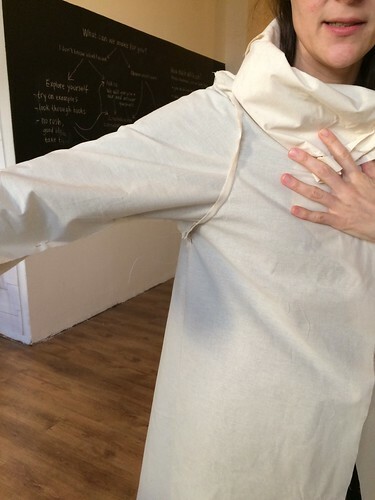 We’re trying to decide if we should re-make the pattern to be more fitted around the shoulders, or to keep it closer to the original design with no defined shoulders and more of a “wrapped up in a blanket feel” as the shoulders slouch over the shoulder and cling to the body because of friction. 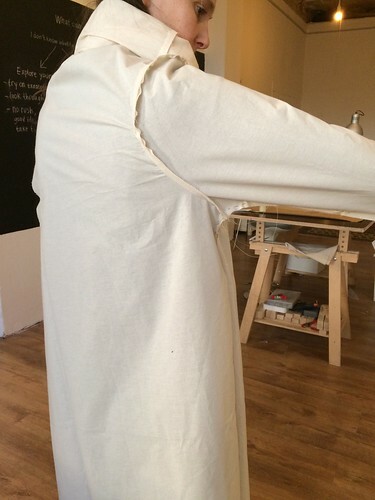 Toile made up in non-stretch calico fabric. 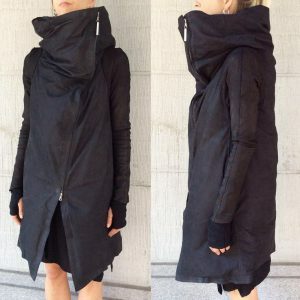 Not sure if it will feel/look good in non-stretch? 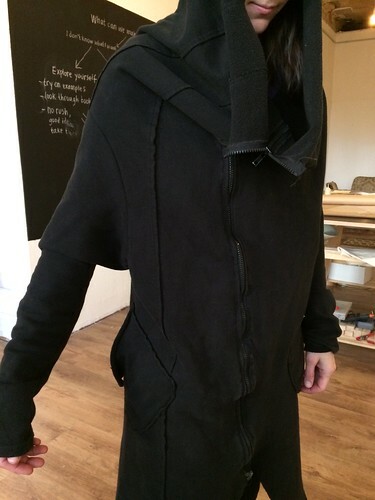 Might need to solve it with a more fitted sleeve, but then we loose the blanket feel. 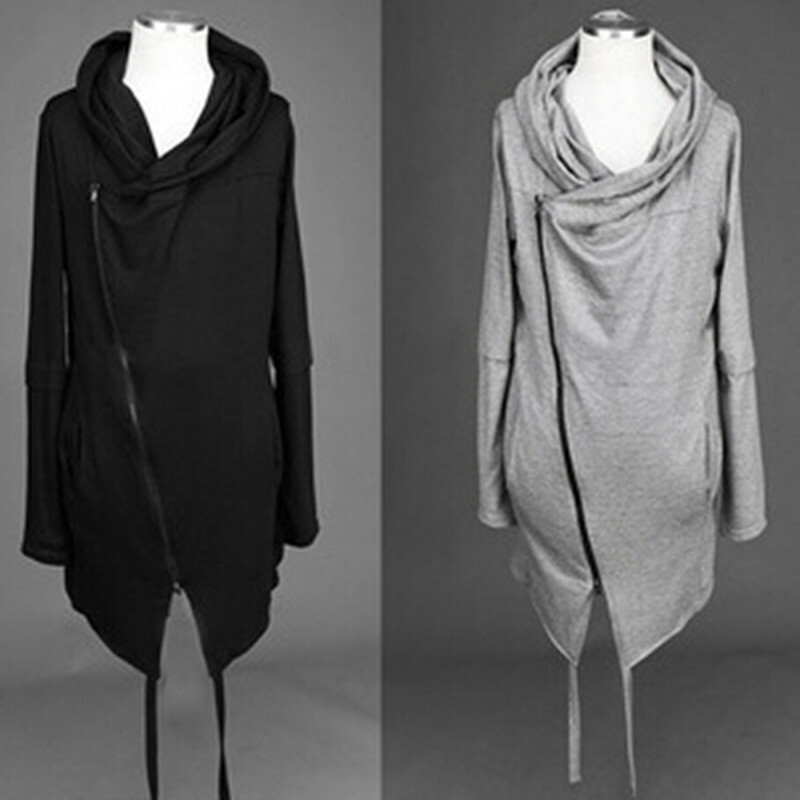 One concern is that we’re not sure how this slouch looks will feel and look work in a non-stretch fabric. 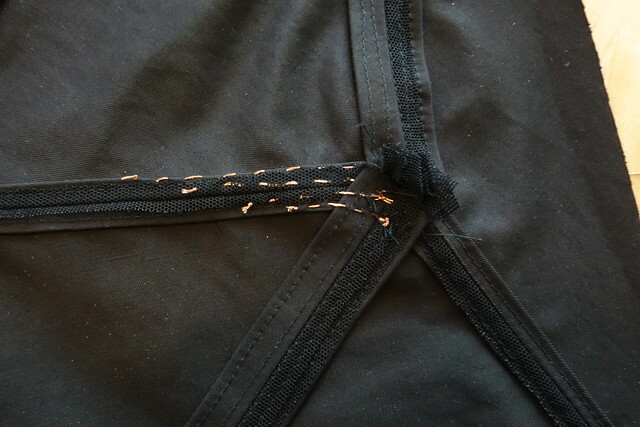 The reason to use a non-stretch fabric would be because we intend to cut the pattern up into geometric pieces and insert the fiber optics and circuitry along these seams, which makes sense to do in non-stretch. This is an example of a similar pattern but with a very fitted should area. Could this be an option? 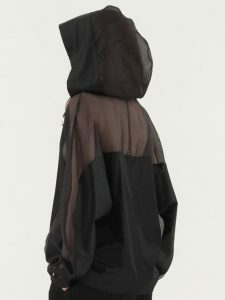 This is just an example to show the use of very light/translucent fabric, which might be an interesting solution considering a design that causes you to sweat less and needs to be washed less too. 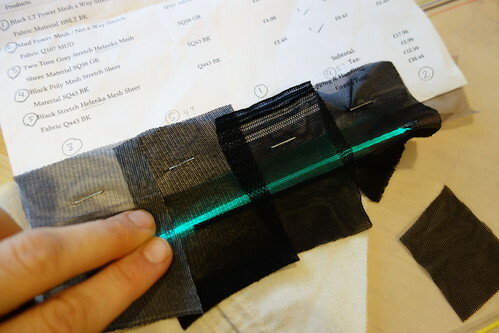 We’re starting by making samples to try out how to embed fiber optics into the seams. 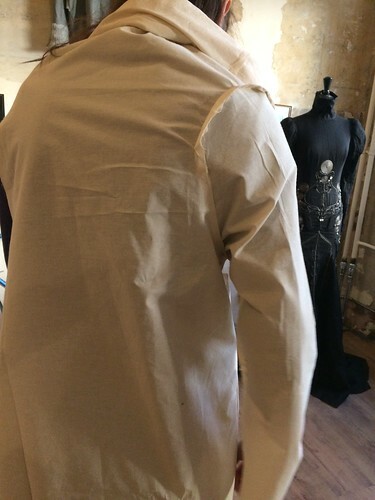 As well as selecting the material we will re-make the jacket from and how to reconstruct his jacket’s pattern either through tracing the original or constructing it based on a shirt pattern. 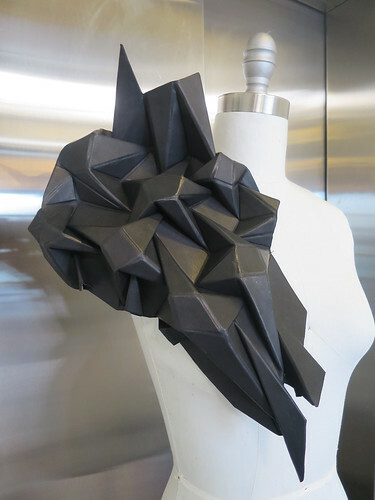 For Sebastian’s partyGeometricJacket we are segmenting his jacket into triangular polygons. 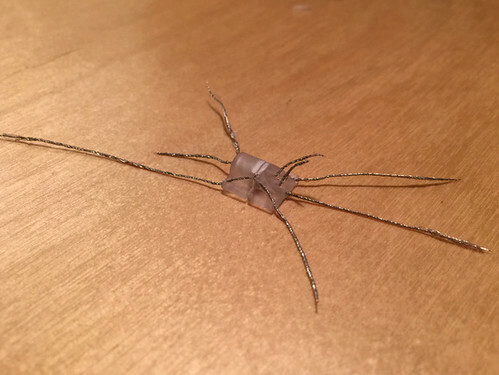 the 3mm diameter fiber optics will run along the seams of these polygons and be individually addressable. 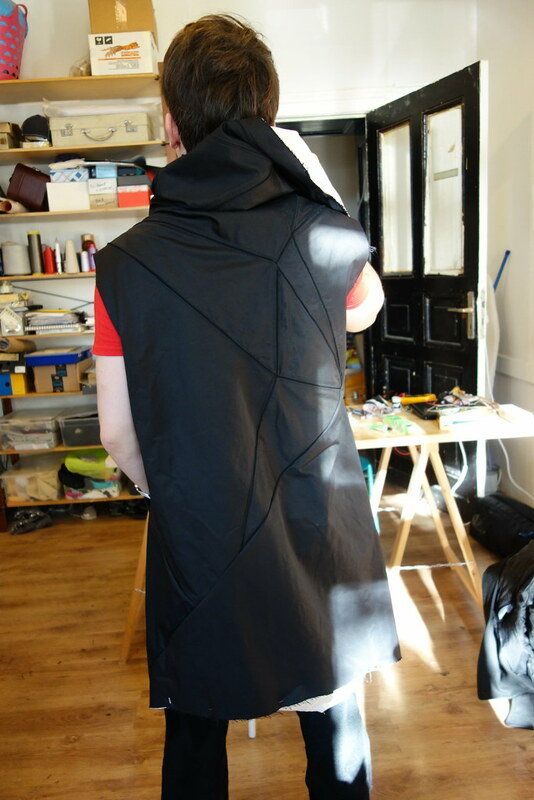 We started out refining the jacket pattern so that it would be well fitted. 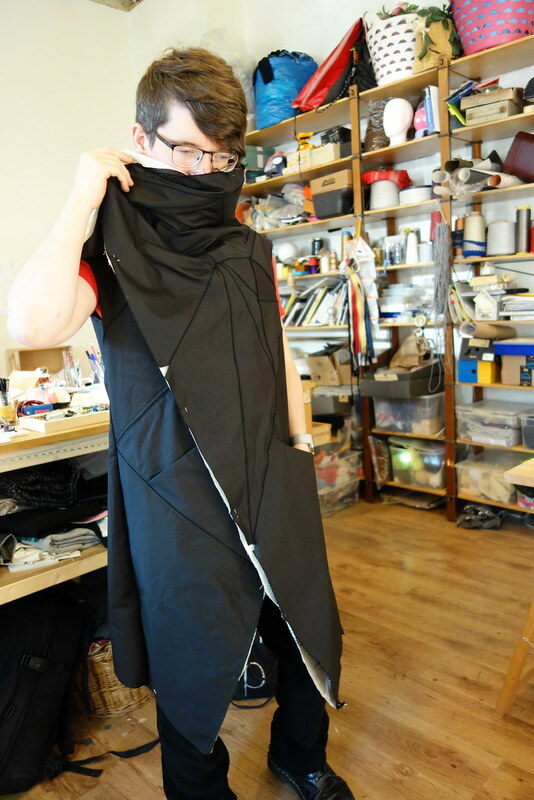 We then then marked the polygon pattern directly onto the jacket and transferred these lines (which will all become seams) back to the flat paper pattern pieces. 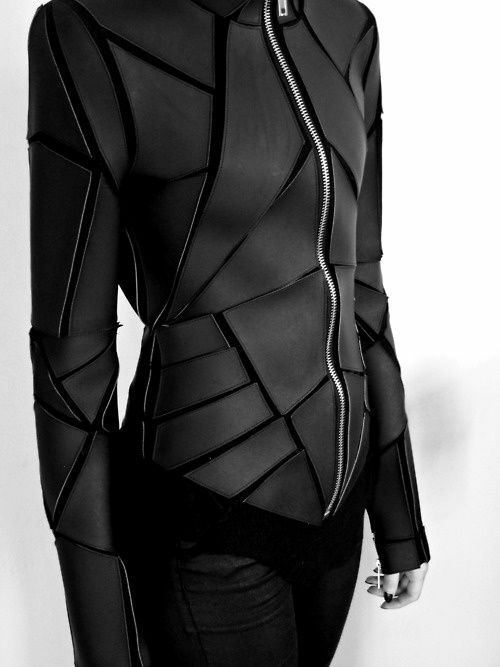 In doing so we started to think in more detail about how to run the circuit through the garment. 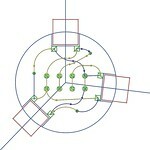 The neatest solution we can think of is to run the traces (power, ground and data) through the polygon seams. 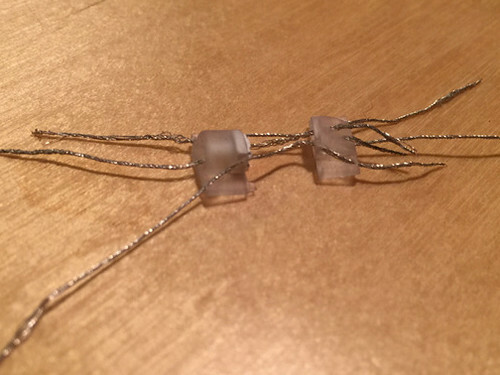 At first we imagined we would use something similar to individual Bumblebee connectors for connecting the conductive threads running through the seams to the LEDs at the ends of the optic fibers. We are currently counting about 40 LEDs total. 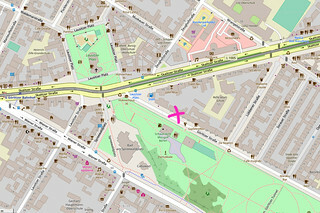 A) There is no unique path through all the polygon seams that only passes every intersection once (which would be necessary for electrical connections to not touch). 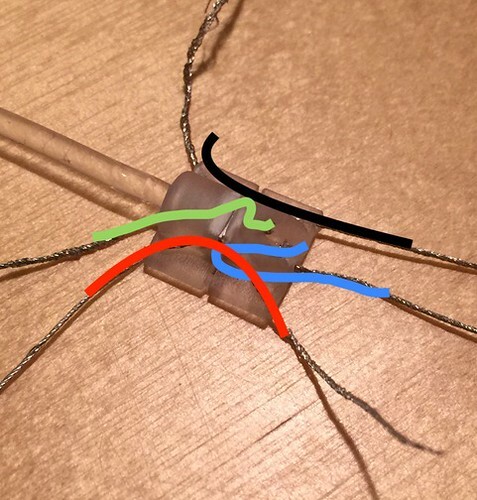 B) That the Bumblebee (optic fiber to LED connector) covers the tube, meaning that if the connector wants to sit directly on the seam, then the lit optic fiber can not extend all the way into the corner(s) of the triangles. 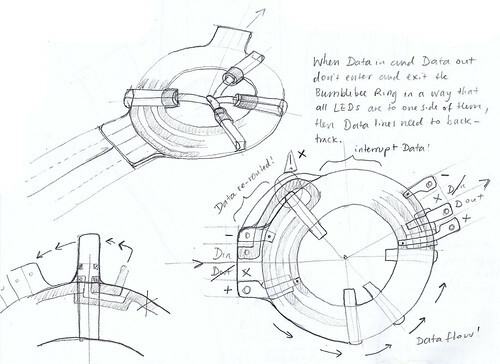 Instead of spreading the LEDs around as much as possible, to instead cluster them around as few junctions as possible. 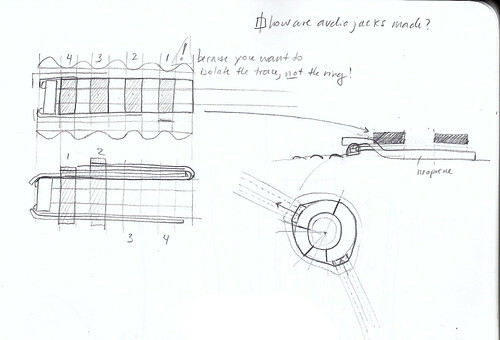 And then design “Bumblebee Rings” that solve all the LED connections on-board. See bellow illustration. 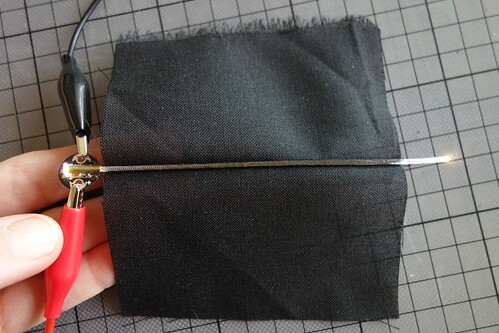 The optic fibers could bend/curve over to the nearest seam…. but this does not solve problem A.
Reflective caps at the ends to reflect the light back into the tube! 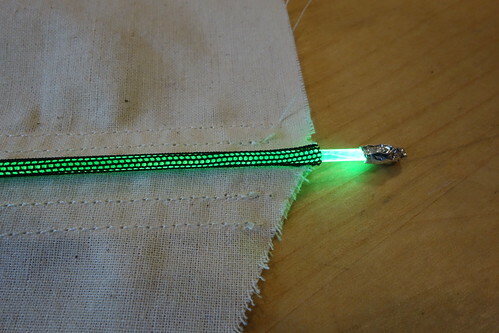 The neopixel SMD mini LEDs are mounted vertically on flex PCB. 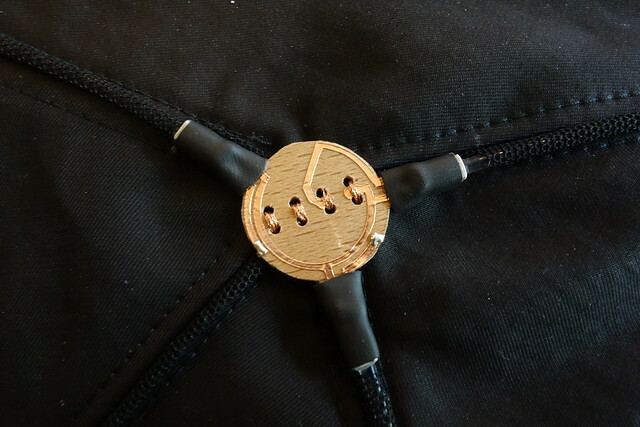 The top side connection is brought to the side with copper tape. 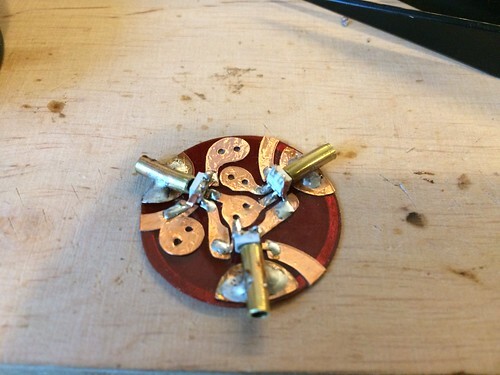 This is only possible with hand soldering, and not suitable for manufacturing.. 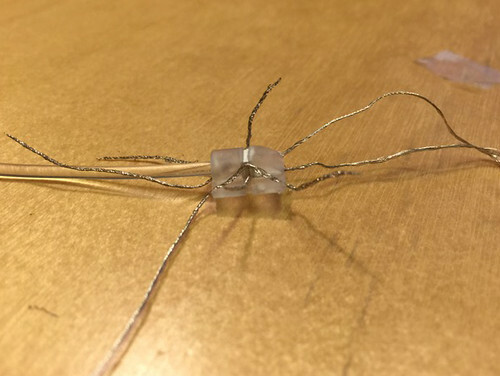 This test version has 3 LED+tube placed in 120 degrees angles. (they are equally angled) We used 3mm brass tube to fix the optic fiber. 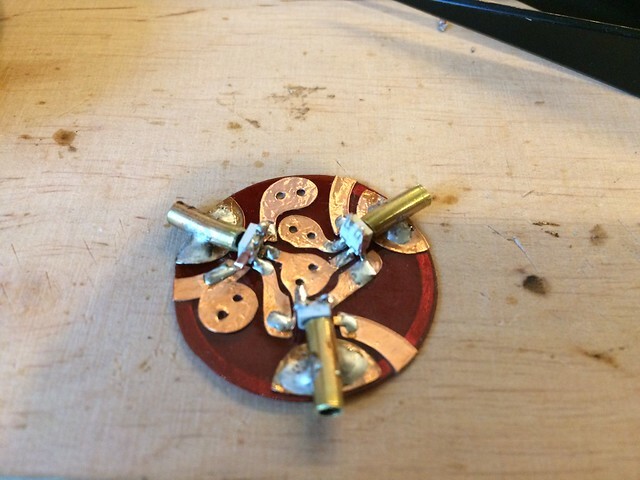 The tube is soldered onto copper foil underneath. 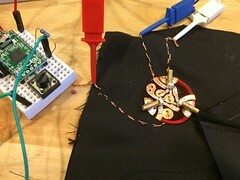 +,-,dataIn, dataOut connection of the ring is broken out as copper foil pad with 2x 1.2mm hole so one can sew the connection like buttons. 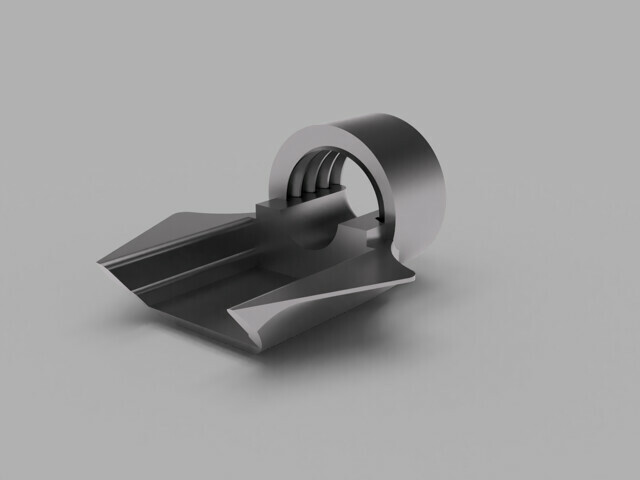 The next step will be to see if this design can be used together with seam conductive connection channel. Today we prototyped a double sided PCB version of the “party button circuit”, and it looks like it could work really well. 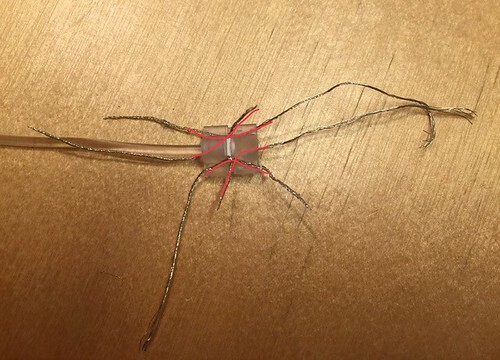 This version has little tabs on it for helping to fix the fiber-optic ends tube recepticals with shrink-tube to the PCB, but of course these will not be necessary if the 3D print is designed with the fiber-optic holding included. If we have these boards manufactured, they can probably get a few mm smaller. 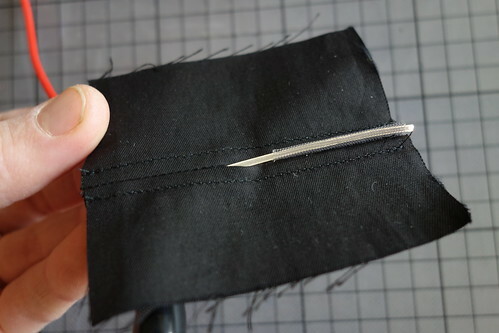 The minimum size will probably be given by the size and spacing of the holes for sewing. 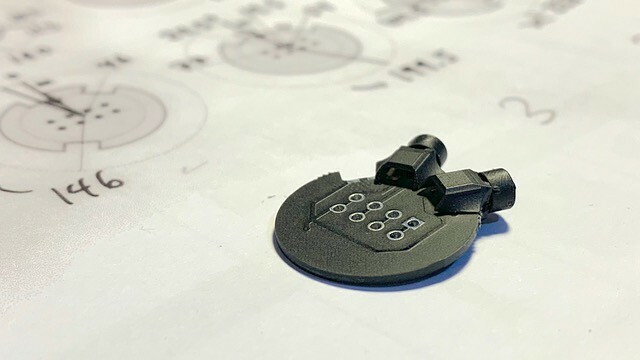 Sebastian came to the shop today and we went over the last “Party Button Circuit – Simulated Double Sided Hard PCB” version and discussed how the PCB and 3D print will come together. 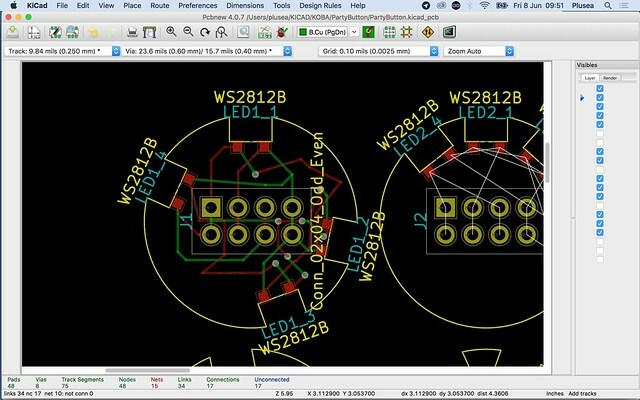 While Sebastian worked on the 3D model, I put together the PCB in Eagle to start working towards the final dimensions and a file/format that we can order manufactured PCBs. But I made a mistake in the dimension of LED. 5mm instead of 3.5mm…. 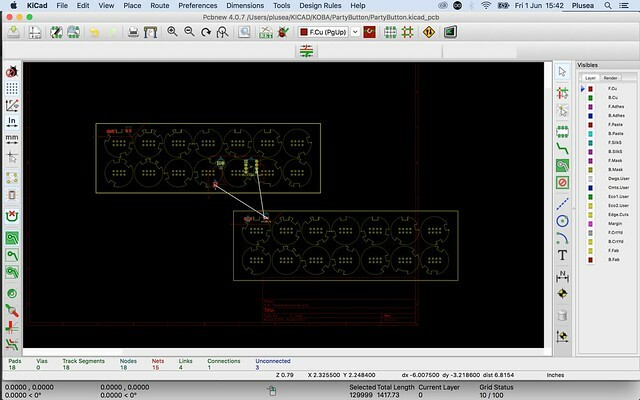 and this was the point i really started to reconsider switching to KiCAD (open source and free PCB CAD software). 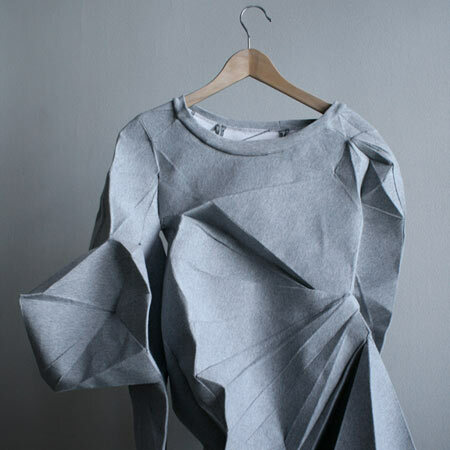 No size or layer restrictions, plus open community and non-commercial values. 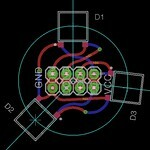 So, I made the decision and for the last two weeks have been VERY slowly learning the joys and pleasures of switching from EAGLE to KICAD. 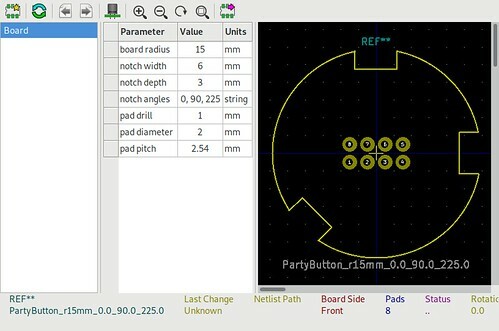 First, because I knew I would need to construct a custom footprint for the LED to be mounted on the edge of the PCB, I looked into how to create custom footprints in KiCAD’s footprint editor. 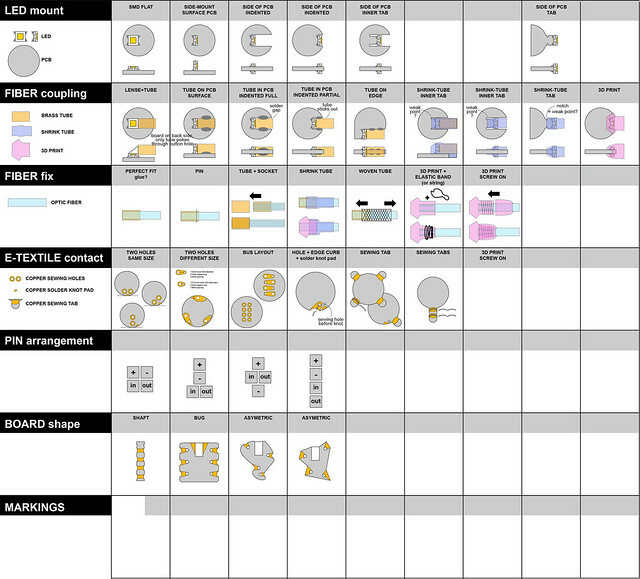 This has it’s quirks of active libraries and netlists and updating netlists…. but it all works and makes sense. 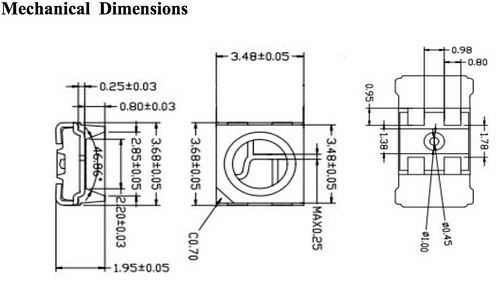 This allowed me to skip the exact dimensioning and instead I just worked off the existing (trusting it is correct). Then also had to figure out how to move a solder pad from top copper layer to bottom copper layer in footprint editor. 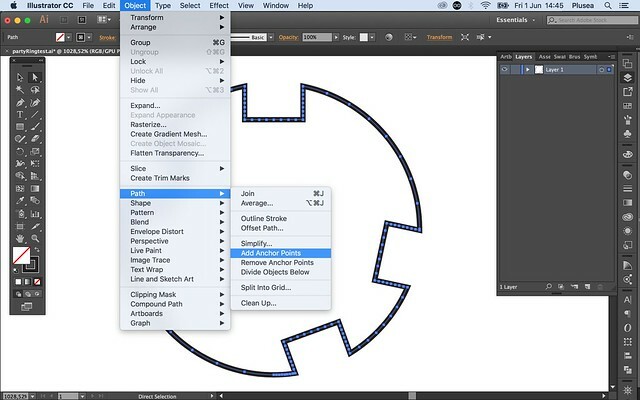 Could not find flip function but easy enough to do in edit window (hover over part + e) where you can select the layer. 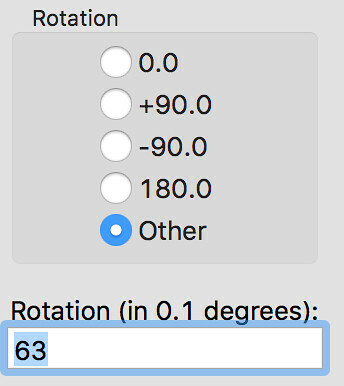 …but DXF files exported from Illustrator are not “the right kind of DYF” so nothing appears. 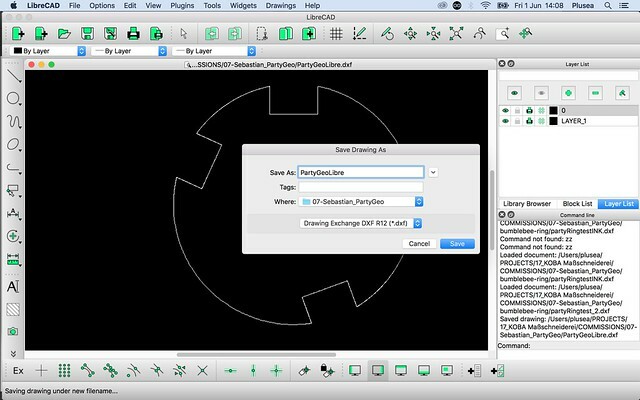 Instead tried following tutorials that showed how to export DXF from Inkscape… but same thing here… nothing appears. 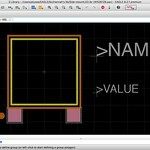 Go back to Illustrator and add in more anchor points, export as DXF. 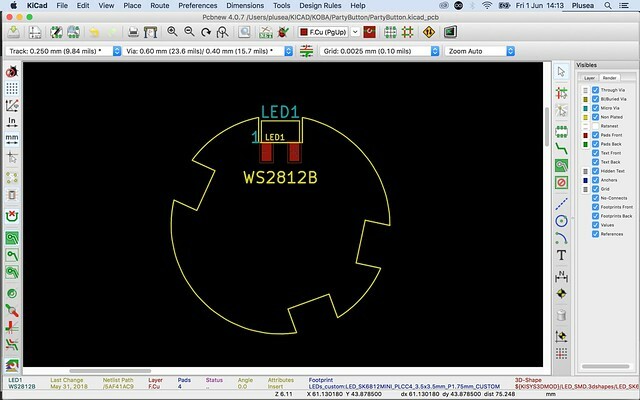 Import DXF to LibreCAD and it looks good! 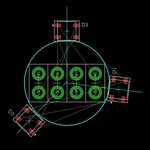 Import into KiCAD and it looks perfect! 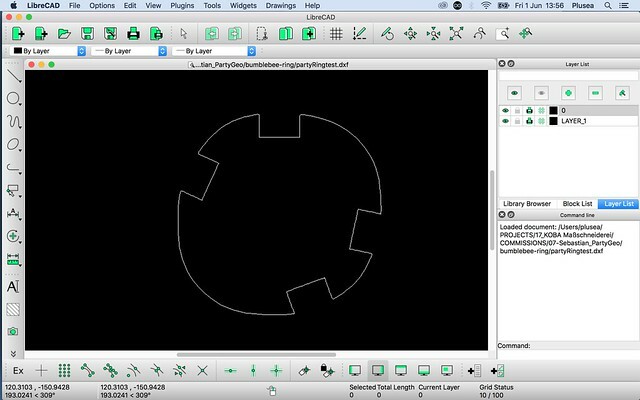 DXF exported from Illustrator uses bezier curves to define shape. These take up memory resulting in larger file size. This large file size (14MB) slowed down KiCAD extremely so that it was basically unusable. 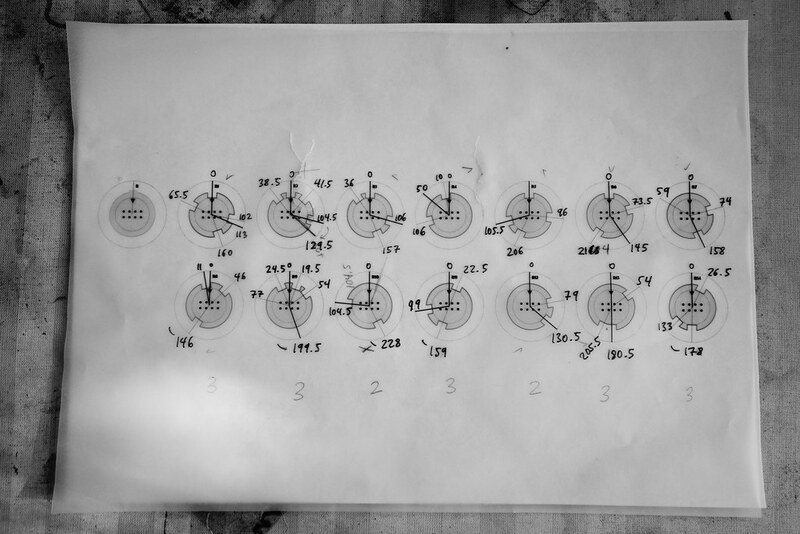 Then I need to go through all the LEDs and rotate them to the exact same angles as the outline. 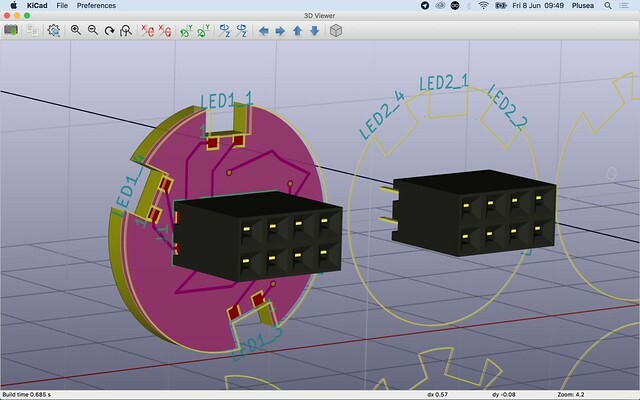 Hover over the LED + “e” –> opens edit window. To rotate enter the angle *10! 63 = 630! 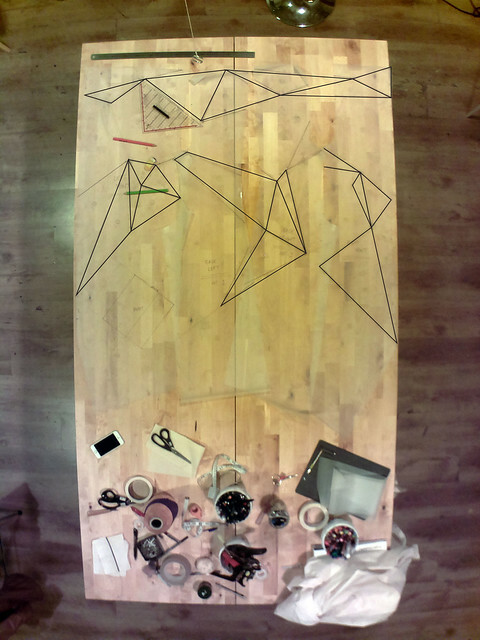 I got the first board layed out and it looks… well… interesting. it is definitely going to be a lot of handwork for each board. and I have to let go of wanting to control the shape of the traces and just go with what KiCAD kind of does of it’s own accord. 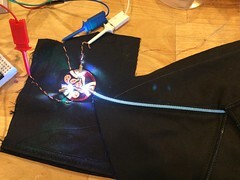 – is the footprint of the LED really going to work well – we have no way of testing this before ordering. 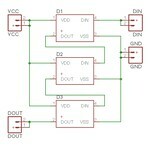 – on the boards that have very close LEDs, will there be space for the traces and vias? 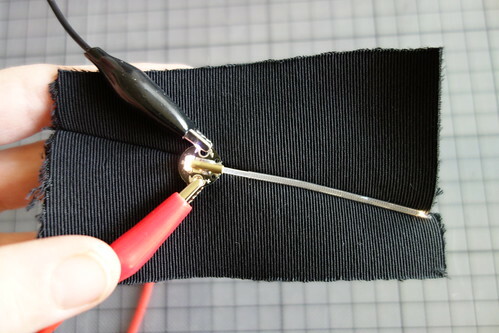 – will the soldermask coating hold up as insulation against the conductive thread sewing between the holes as there are traces laid between these holes. i soldered up one board and noticed one embarrassing mistake. the footprint was designed for 3mm thick board, and in my head i mixed up lulu&partygeo just before placing order. 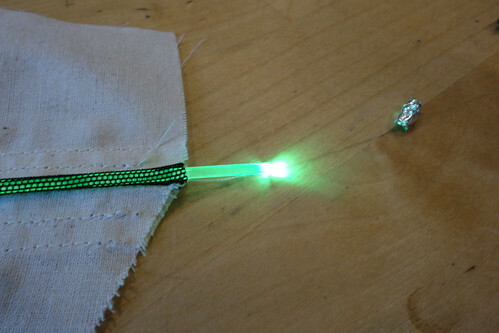 so with 1mm thick board there is a bit of a gap between LED pads and solder pads, but it is still easy to solder. stencil for holding LED exactly half-way would be nice. 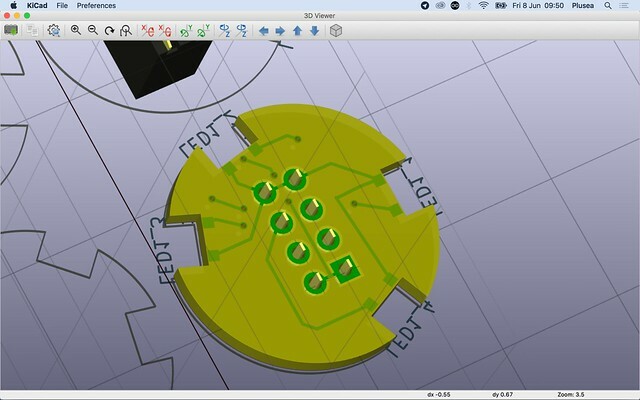 Talk about 3D print solution for the PCBs. 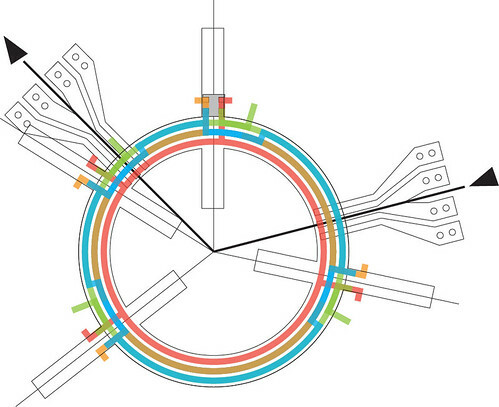 the plan is to solve all LED to optic-fiber tube connections in single 3D print per PCB. 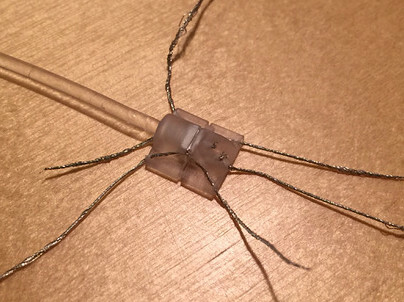 – this could be done in flexible filament so that it simply pulls over the PCB. – otherwise 2-piece hard versions that click together. 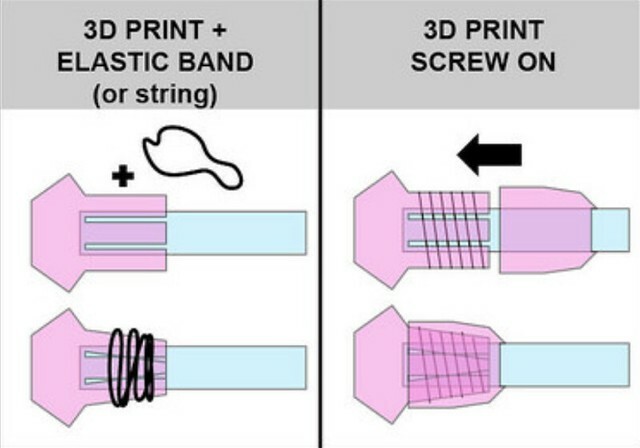 – we try to avoid using any glue, for the case that we have to replace a broken print at any time. we aim to meet again early November. 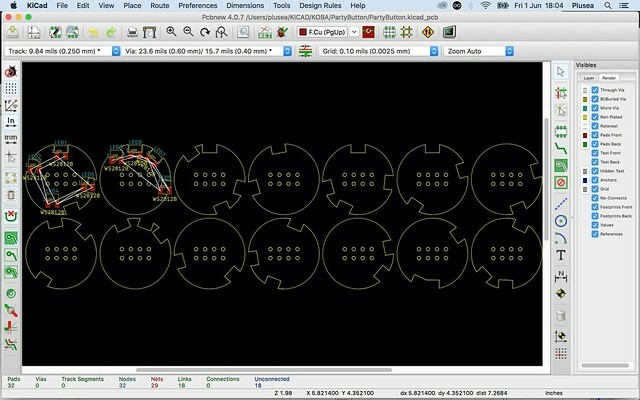 This week Sebastian emailed us renderings and photos of his first tests for the optic-fiber coupling to his party geometric button PCBs. 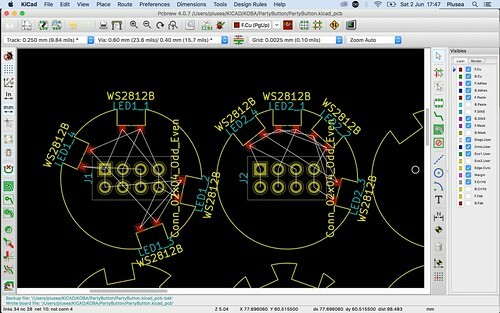 Going over Sebastian’s 3D printed PCB buttons that connect the ends of the optic-fibers to the LEDs.